I have to confess that I avoided most of the ketogenic carb swaps like cauliflower rice and zucchini noodles for a long time. They seemed like a lot of extra work when I’d rather spend less time in the kitchen. My thinking has changed recently when I actually made cauliflower rice for the first time. I was blown away by how tasty it was. In fact, it was delicious and added a wonderful flavor to the meal compared to rice which merely carries other flavors. I am now a total convert to cauliflower rice and if you haven’t already tried it – I recommend it! The benefit of having of few ketogenic carb swaps up your sleeve is that you can easily adapt meals already in your repertoire. Instead of learning a whole lot of new recipes, just add a ketogenic carb swap for yourself and the family can eat their regular favorites. This works perfectly for a lot of family style dishes such as meatballs, pasta and meals served with rice. The other ketogenic carb swap that I was too lazy to try was making vegetable noodles to serve with pasta dishes. Eventually a friend gave me a Microplane Spiral Slicer (Spiralizer) and I begrudgingly made zucchini noodles. Creating the noodles was easier than expected. It was just a matter of pushing the zucchini into the cutter and turning it. The added job is cooking them if you choose to. How To Cook Zucchini Noodles. Heat some olive oil in a fry-plan and cook zucchini noodles, tossing frequently for 5 mins or until cooked. Season with salt and pepper and serve with your favorite pasta sauce or meatballs. Cauliflower rice is delicious when cooked in butter and with salt and pepper. I prefer this over rice as it adds another layer of flavor to your meal. You can add spices (dry or fresh), lemon juice, garlic, pine-nuts etc. 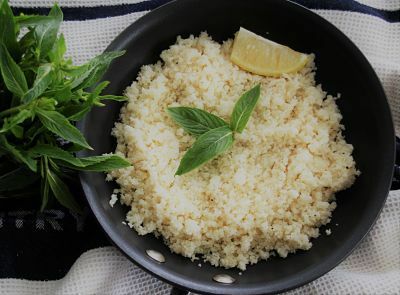 Check out the recipe for 10 Minute Cauliflower Rice. After blitzing the cauliflower in your food processor (before cooking) keep unused cauliflower it in the fridge for 3-4 days ready to use. 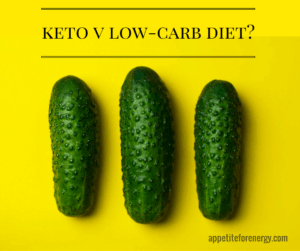 So you thought you would have to bid farewell to pasta and noodles while on the Ketogenic Diet? 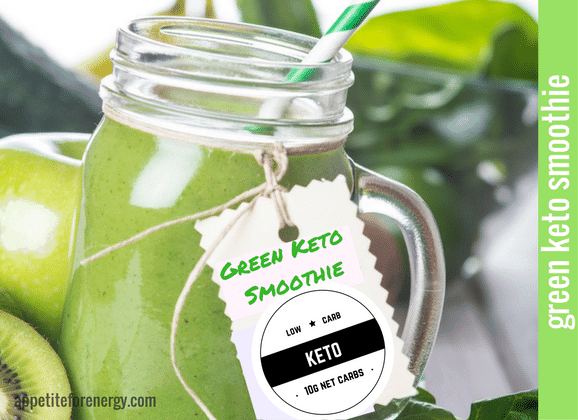 You will love this ketogenic carb swap. 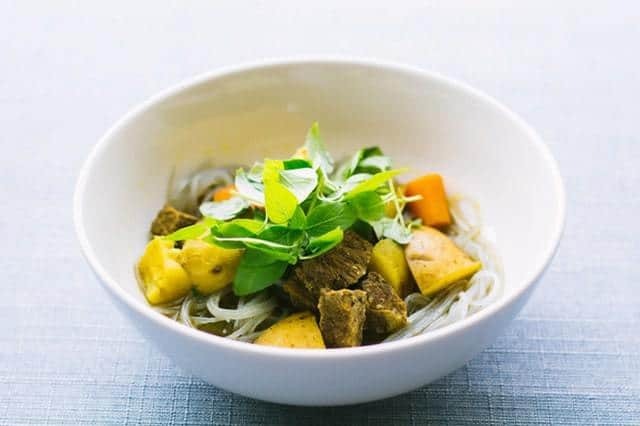 Konjac noodles are made from the konjac vegetable and are pre-cooked and only require 1-2 minutes in boiling water and they are ready to eat. Use them with delicious creamy pasta sauces or add to Asian dishes, noodle style. Quite handy when you need a quick noodle/pasta alternative. Never heard of konjac? Konjac is an ancient root vegetable grown in Japan, China & South Korea. The root of the Konjac is used to make flour, pasta or noodles and it is a dietary staple in Japan. It has close to zero carbohydrates but has some fiber.This makes it ideal for ketogenic diets and low-carb diets. 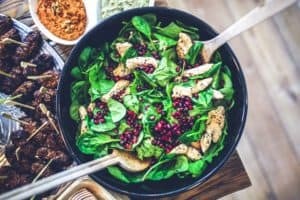 Depending on where you live, these products are becoming more widely available as low-carb eating becomes more popular. Check your local grocery store for these or new similar products. Try Miracle Noodles and Better Than Pasta. There are a few recipes for low-card bread which are quite easy to make. They essentially use only eggs and protein powder. I have made this one from Maria Emmerich a few times. I would recommend watching the video and make sure you whip the egg whites until they are very stiff. On my first attempt at this, the bread was very eggy tasting because the egg whites were not stiff enough. Despite the very unnatural sounding name, erythritol is not an artificial sweetener like aspartame. I have tried a number of natural sugar substitutes and erythritol is one of the better tasting. It has close to zero carbs and zero calories and looks like sugar. Erythritol is a naturally occurring sugar alcohol. It is found in plants, fruits and fungi including mushrooms. You need to use a greater quantity to achieve the same taste because it is only about 70% as sweet as sugar. The uses are many – from baking to adding to tea, coffee, smoothies or anywhere that sugar would be used. Erythritol can be purchased in granulated form (Now Foods do a great one) or powdered form (such as the Swerve brand). 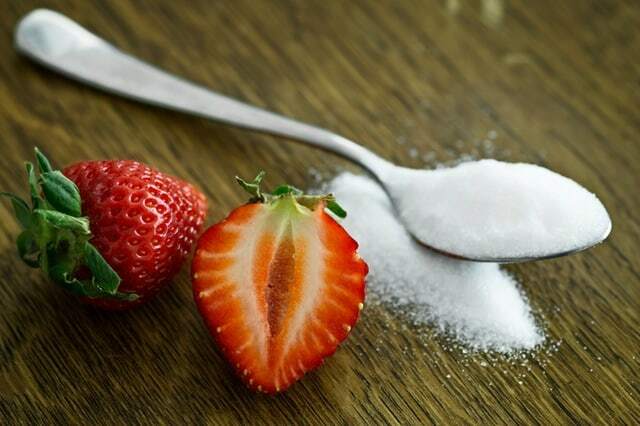 Non-sugar sweeteners are also great for controlling your blood sugar levels without cutting out all sweet foods. They are a useful sugar substitute for diabetics. Other natural sugar substitutes to try are xylitol, stevia and stevia glycerite (liquid version of stevia). 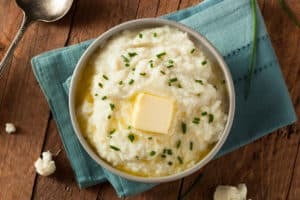 If you are missing your potato mash then you have got to try cauliflower mash. It’s the ultimate ketogenic carb swap. I was not expecting to like this but found that it was very tasty as well as being having a beautifully smooth texture. The cauliflower is cooked in stock, and cream so this infuses it with a lovely flavor. The addition of butter when it is pureed completes the creamy deliciousness. Almond meal can be used as a substitute for breadcrumbs in meatballs, baking or to make a crispy crust for fish, chicken or pork. Make easy 30-minute low-carb meatballs with almond meal instead of breadcrumbs. Serve with zucchini noodles or konjac pasta (see point 3 above). Or serve low-carb meatballs on a bed of baby spinach leaves with some olives, avocado and a drizzle of extra virgin olive oil. That is my favorite way to have meatballs! Cookies, scones or muffins can be made with almond meal in place of flour. They will have a denser texture but will be much lower in carbs. While you cannot directly replace the quantity of flour with almond meal, there are hundreds of almond meal baking recipes out there. A quick search on the internet will turn up plenty of options. Just make sure you substitute erythritol or another low-carb sweetener (see point 5 above) for any sugar in the recipe. To make a crispy crust for fish, chicken or pork – dip your protein in beaten egg and then coat in almond meal. Pan fry in a generous amount of oil. Easy! Using almond meal is also a good substitution for gluten-free diets. 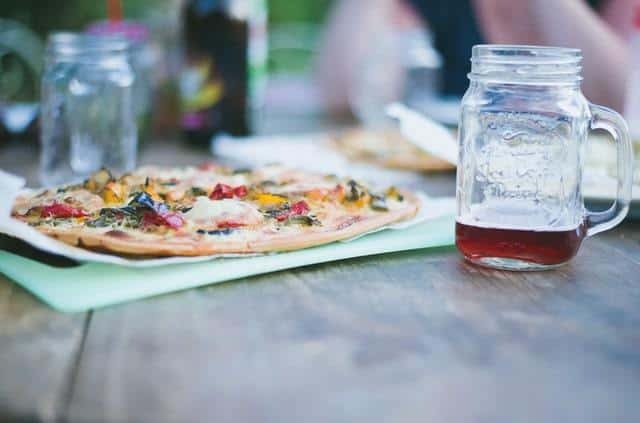 I haven’t yet tried cauliflower pizza yet but it is high on my list of keto recipes to try. The photos of cauliflower pizza look mouth-wateringly delicious so I will be sure to post when I have tested some of the recipes out there. Our final ketogenic carb swap is avocado. Avocado is your friend when eating low-carb, high fat. They are high in monosaturated (healthy) fats, Vitamin C, folate (important if you are pregnant), vitamin E, fiber and potassium. Low-carbers can easily become deficient in potassium and avocado is a good source. This is because the body sheds excess water and loses some electrolytes while eating fewer carbs. Try using half an avocado instead of banana in your regular smoothie as it creates an amazing creamy texture. It’s not as sweet though, so you could add a sweetener (see point 5) such as erythritol or stevia glycerite if you need to.